Indian Union Budget on 10th of July 2014 added service tax for online and mobile advertising. It means is any Indian individual or company involved in an online or mobile advertising businesses need to pay 12.36% as service tax on the overall turn over. Remember this is not on the profit but on the overall turn over. As an example if you charge 100 Rs for online advertising, now you need to ask Indian clients now to be paying 112.36 Rs. You pay 12.36 Rs as service charge to the service tax department and then use 100 Rs for online advertising for your client as earlier. If your audience is not Indian but Global, you cannot ask for service charge and so you may need to pay 12.36% from whatever you charge i.e. from Rs 100 in the above example. Google India is a registered company in India and Adsense Payment to Indian publishers used to come from Google India. Since April 2014 they opted to stop payments by Check and payment from Google India and the only payment option is Wire Transfer (My last Adsense Check). The Wire transfer payment does not come from Google India but from Google US and so it the payment to Indian Adsense Publishers is not subject to service tax that Google India needs to pay. 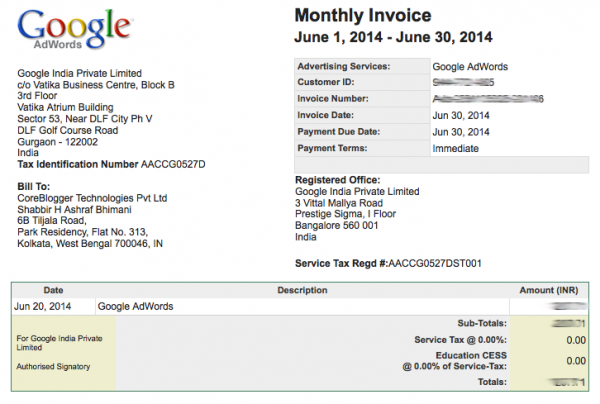 Service charges May Come Soon be Part of Google Adwords India? 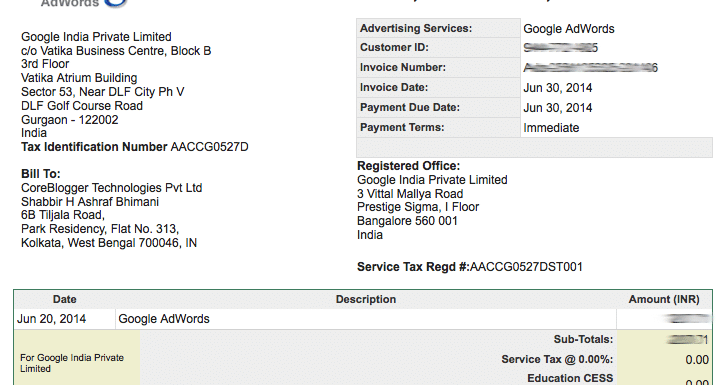 Google Adwords June 2014’s Invoice still has NIL service charge but soon it will be part of Google Adwords in India and reflect the same in the Google’s Invoice. The service charge can only be collected from Indian Advertisers and the money possibly will be used for Google India Operations. Payments are not in INR anymore but they are in USD and so you may not be getting as good Forex Rates as earlier and on top of that banks deduct charges for Inward Wire Transfers remittance. On top of that as an Adsense publisher, you are now responsible for paying your service tax if your income is above 10 Lakh in any fiscal year. Details about service tax slabs can be found in this article here at chartered club. As an Indian Adwords Advertiser, it will now cost 12.36% more to advertise. Do you know, how we can save service tax? No. I am not a tax consultant and you need to consult the right person for better options you can have at hand.